Sophomore student, Allison Mayes, won the 2nd Place in the 40th Anniversary, Earth Fest 2010 Recycled Contest. The contest was held on April 22 at the Pegasus Plaza and AT&T Plaza. 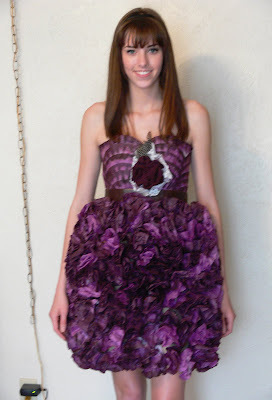 Modeled by Allison Mayes, the dress was made out of hand dyed coffee filters gradating shades of purple, recycled fabric, feathers, and twigs. Congratulations Allison! !